If you missed Post #1, click here. For Post #2, click here. The final of three events I attended through Startup Safary Berlin 2015 was in the historically-fascinating offices of Axel Springer Plug&Play Accelerator, on Markgrafenstrasse, in Kreuzberg. The first floor of the building – where the accelerator program is located – used to be the “emergency” editing suite for Axel Springer journalists during politically charged times. The Axel Springer building is nearby and during bomb threats the editors would relocate to the Markgrafenstrasse location so that the Bild newspaper could continue to publish on time. 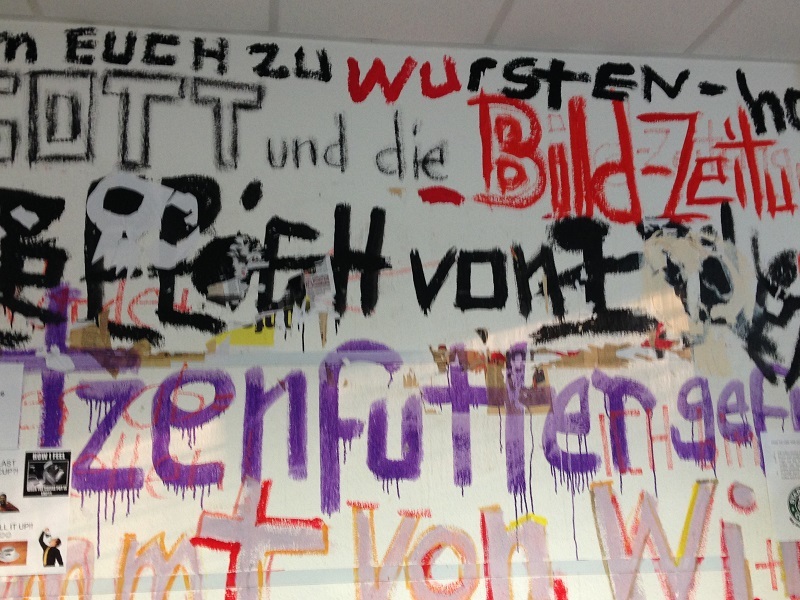 More recently, the artist Clemens von Wedel used the space, and the graffiti he left on the walls remains to provide atmosphere for the visiting startups who participate in the accelerator program. Graffiti in the offices of the Accelerator. If you missed Post #1, click here. The second of three events I attended through Startup Safary Berlin 2015 was held in the offices of Remerge, on Oranienburger Strasse in the Hackescher Markt neighborhood of Berlin. Remerge, which launched in 2014 in Berlin, helps app developers re-engage users who may have gone inactive, by targeting those users through personalized ads or messages outside of the app – across more than 330,000 other apps. The office event began with a brief overview of the origins of the company by co-founder and CEO Pan Katsukis. In his presentation, Katsukis referenced a blog post he wrote in 2014, as the company was acquiring seed funding – How We Raised $1M Seed Money in 5 Weeks in Berlin. In August 2015, Remerge announced a $3M Series A round, to support the opening of a San Francisco office.